“Are Miraculous Gifts for Today?” A look at four views in Christian Theology | J.W. Wartick -"Always Have a Reason"
What are we to make of the notion of miraculous gifts today? Have they continued into the modern era, or did they cease after the apostolic age? I want to preface the following discussion by expressing the fact that I am by no means an expert in this area. 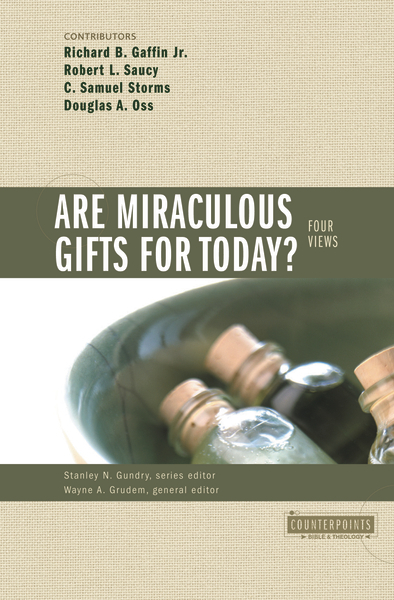 I only recently finished reading Are Miraculous Gifts for Today?, which presents four views on the issue of miraculous gifts in the church now. The book is the only work I have read on the topic, and so my opinion should not be taken as that of an expert or even a moderately person. I am an interested party with virtually no backgruond in this area. I also want to note that I wish to express a desire to learn more and any interested readers should please comment and provide insights/corrections/concerns as they see fit. Here, I will outline what I understand to be the four views on the topic (as outlined in the book–I am more than willing to concede there are likely more views), along with a few arguments and against each. After that, I will offer a brief analysis. I’m hoping that you, the reader, will help spur the discussion. Before progressing, it is important to know what is meant by miraculous gifts. Essentially, these are the gifts outlined in various passages of the Bible. 1 Corinthians 12 is illustrative. It lists as spiritual gifts the following: speaking in tongues, prophecy, the gift of wisdom, etc. One must note the issue of the “gift of healing.” What is the “gift of healing” and does it exist today? James 5:14-16 is integral to understanding what is meant by this gift. Perhaps the most central issue regarding miraculous gifts is this: do they continue into today? A secondary, but still very important question is: if these gifts do continue, in what way? Cessationism is the view that miraculous gifts essentially ended after the formation of the Apostolic Church. Richard B. Gaffin, Jr. defends this view. He clarifies his position by noting that he is not arguing that all gifts of the Spirit have ceased. Rather, the question is “not whether but which spiritual gifts continue today” (41). He notes that God may choose to miraculously heal persons, but expresses doubt over people being granted a specific gift of healing. His greatest difficulty lies with the “word” gifts such as prophecy, speaking in and interpreting tongues, and the like. The problem with these sorts of gifts, argues Gaffin, lies in the question of the sufficiency and closedness of the canon. Suppose that prophecy does continue today. What level of authority should be ascribed to it? If it is truly the utterances of the prophet guided by God, he reasons, should we not grant such utterances the same authority as the Scriptures (47)? Gaffin notes that those who hold to the continuation of these gifts generally assert that prophecy may be fallible and thus should not be given the same authority as the canon. Gaffin responds by countering that the Bible does not seem to support the notion of fallible prophecy as a possibility (48-52). Moreover, the gifts of the Spirit were intended for the Apostolic Church as signs of God’s special activity during that period (56-58). The “Open but Cautious” view is championed by Robert Saucy. He expresses the view that the Bible does not make clear whether specific miraculous gifts continue today or not. Thus, he remains open to continuation of these gifts, but cautious in their application and use. Central to Saucy’s caution is the argument that miraculous gifts are centered around specific times and purposes within salvation history. Thus, according to Saucy, miraculous gifts act as signs of God’s activity within very specific contexts. The Apostolic Era is to be considered unique, and the expression of spiritual gifts during this time should not be read verbatim onto the present era (100-102). Moreover, the Biblical evidence for periods of miraculous activity is “uneven” and “particularly concentrated at certain times,” specifically “that of Moses and the Exodus, the ministries of Elijah and Elisha, and Christ and the apostles” (103). Miracles are thus to be understood explicitly as a “sign” with a specific purpose in mind to “give credibility to something” (105). Miracles are used to “authenticate” specific individuals in times of need (108). Saucy appeals to the history of the church to make his point. He argues that throughout the history of the church, there is little miraculous activity noted. Thus, although we should be open to the possibility that such gifts may manifest themselves, we should remain cautious of claims to that effect. Saucy concludes with a discussion of individual gifts and what the Bible teaches about them. Representative is his discussion of prophecy, which notes several clarifications regarding how it should be used and understood (including that it is to be done in an “orderly fashion” and that the content will be “edifying to the community”) (128). C. Samuel Storms argues that miraculous gifts do continue today, but that the doctrine of “subsequence” should be rejected. Subsequence is the notion that after conversion, there is a “baptism in the Holy Spirit” which is initially experienced by speaking in tongues and manifests itself in various spiritual gifts (176). Storms argues that cessationists misrepresent those who argue for continuation, for cessationists often appeal to the “infrequency” of the miraculous in order to argue against the notion of miraculous gifts. They argue that this demonstrates that such events are purely the actions of a sovereign God acting whenever God chooses. In contrast, Storms notes that God’s spontaneous action may indeed empower individuals and indeed that the intermittent nature of the practice of such gifts does not undermine their classification as spiritual gifts. Storms further asserts that although miracles have indeed been used as signs, this fact does not allow one to reduce the miraculous gifts to being only signs and nothing else (188-189). Storms analyzes a number of major arguments for cessationism and finds them all wanting. In particular, Storms presses the notion that the Bible nowhere declares that the gifts found in the Apostolic period would have some cutoff time period. Douglas Oss argues that defining Pentecostalism as a “second blessing” theology must clarify what they mean by “second blessing.” He notes that Pentecostals do believe that believers receive the Holy Spirit post-conversion as an empowerment for charismatic gifts. However, this filling is not part of salvation nor is it required for salvation. Instead it is part of sanctification: it is empowerment by the Spirit. Moreover, Oss notes that there may be several empowerments or “refillings” of the Holy Spirit, for there is diversity in the “manifestations” of the Spirit (242-243). Oss traces the Biblical data and concludes that the Old Testament shows that there is both the “inner-transforming” work of the Holy Spirit and the “empowering” work located therein. In the New Testament, Oss notes that the Holy Spirit works to empower the believers with various manifestations of miraculous gifts. The gifting of the Holy Spirit is initially observable through speaking in tongues, but again this is not required for salvation. It is merely the pattern of God’s gifting. First tongues, later other gifts, though this is not always the case or even a requirement (260-263). Oss appeals to Joel 2:28-32 to note that the last days will not conclude until Christ’s second coming and so we should expect giftings of the Spirit throughout the present era (266ff). It seems to me that there is little warrant for arguing negatively that the miraculous gifts do not continue today. Gaffin provided no textual basis that I could discern for holding that when the NT authors speak of these gifts within the church, they intended to limit the gifting in their own era. Moreover, I think that Joel 2:28ff does speak of the current age, though some of it seems to be yet future. The future fulfillment left for some of the passage does not seem to imply that it should all be taken is “not yet,” however. That said, Gaffin’s concerns regarding the authority and inspiration of prophecy should be rightly noted. The issue of the nature and authority of prophecy in the modern period is one which the other offers attempted to address, but it seemed to me they came up short in virtually every case. Moreover, some of the Pentecostal position seemed to be a bit off to me. Why even argue that speaking in tongues comes first, but then qualify that by saying that it doesn’t need to or that it may not always be the case? Would that not suggest that the pattern isn’t much of a pattern after all? Storms in particular did an excellent job of showing the error of arguing that miracles in the Bible centered only around certain periods of time in which “signs” were needed. Although it seems clear that the Bible is a selection of time periods and parts of history, God’s miraculous activity is observable throughout much of the Bible. To argue otherwise, and to then build a framework for interpreting miraculous gifts for today (as both Saucy and Gaffin did to an extent) seems to be an overreach given the data. Thus, I would say my position seems to be closest to a synthesis of Storms and Saucy. I think Saucy does not go far enough in his allowing for gifts of the spirit, but I think that Storms struggles with the notion of the authority of such continuing prophecy. So what do you think of this issue? What is your position? Share your thoughts in the comments below. « Really Recommended Posts 8/30/13- Dinosaurs, Mumford and Sons, Design, and more! Great post J.w., as always! I share the same position you share – I would put myself between Storms and Saucy. But, one of my roommates (an undergrad student at Boyce College) shared with me this perspective that I find interesting – based off what you read I’d be curious to hear your thoughts on it. When the apostles go out from Pentecost to proclaim the Gospel, signs and wonders follow them when they go to places that the Gospel and the Kingdom of God has not yet come. The reason why we don’t hear much about it during the rest of the history of the church is because the writers are (mostly) in locations where the Gospel is widespread and the kingdom of God has been announced. For all we know (and this is my main reason for rejecting cessationism) missionaries who are going to unreached people groups, places where the Gospel hasn’t come yet, might be seeing signs and wonders but we just aren’t able to hear about it. The timing may 2000 years apart, but the situation is the same – signs and wonders accompanying the proclamation of the Gospel where it hasn’t been proclaimed yet. If I need to reword any of that let me know. Thanks for the great post! Sam Storms in the book actually addresses the notion that there is silence about miraculous gifts for long periods of church history. He argues that the silence is largely due to a bias against the existence of such gifts alongside the spiritual illiteracy of the people at the time. He used an example from Spurgeon in which he did not acknowledge the use of the gift of prophecy, despite telling a story that Storms argued was clearly a case of prophecy. I think your own insights are quite solid as well. I also fall between Saucy and Storms, and agree that one likely reason we see less evidence of miracles today is that God focuses them on Kingdom growth. I’ve often heard that miracles are more evident on the mission field, especially in the most unevangelized areas. This would match their occurrence in Acts, where by far the majority are associated with statements to the effect that Kingdom growth was a result of the miracle. This is also reflected by John’s statements in John 20:30-31 about why he recorded those miracles of Jesus. To me, miracles in Scripture are much more associated with bringing people into the Kingdom, than making those who are there more comfortable (which seems to be how we think of them today). Regarding Gaffin’s assertion that the Bible does not support the existence of fallible prophecy, I would have thought Paul’s comments in 1 Corinthians 14:29 indicate exactly that idea. If prophets are to pass judgement on each other, doesn’t that imply the possibility of imperfect prophecy? To a lessor extent, this may be echoed in John’s statement about testing the spirits in 1 John 4:1-6, although of course, the topic there is false prophets, rather that imperfect prophecy. It may be that the principle is more general than that application. I really enjoyed your line about “miracles in Scripure…” I think you make a very good point regarding their purposes. I guess my major issue with fallible prophecy is that, so far as I can tell, one of the tests of a true prophet was that their prophecy comes true, period. Thus, the concept of “fallible prophecy” seems to me to be a misnomer. It either is prophecy, or it is not. And that is determined by the truth/correctness of the prophecy. However, the textual support you bring up is, I think, pretty strong as well. The need to test prophecy may, however, not be referring to its fallibility but to determining whether a prophet is a true prophet. I’d have to think a little about whether prophecy in the OT and NT are necessarily that equivalent. True NT prophecy does fulfill that criteria (ie, Agabus), but there’s also the aspect of “forthtelling”, rather than “foretelling”. Not sure the Bible gives such clear guidance about evaluating such prophetic statements, or prophets who do not tell the future. Paul’s other statements about prophecy being important for edification, and his desire (like Moses) that all would prophecy, implies something more ubiquitous. I find value in the first three views – I do not think they are over, I do not think that you can use a pattern of history to judge what God would be doing today, but I also feel like we DEFINITELY need to be critical of what manifests itself, so we can be sure what we see comes from God, and not alternate sources. I truly believe we all have our own gifts, and that our post-enlightenment world has a very difficult time believing these things exist without proof – but faith is belief in the unknown. Think of this – faith is a gift from God, and itself a miracle of the Holy Spirit. Maybe over simplified, but I find it beautiful nonetheless. I’m not sure about the speaking in tongues being first for all Pentecostals, but I have noticed the centrality of that specific spiritual gift over many others in circles which hold to continuation of the gifts. Regarding each having our own gifts–I think cessationists would definitely agree. In fact, I’m fairly confident the cessationist in the book noted that specifically he did hold that one may still receive “gifts” of the Holy Spirit in the sense of a calling and gifting to that calling. If he did not, I know of other cessationists who do. This is why I think that terminology is what really determines the debate. Very often, it seems to me that continuationists and cessationists are saying the same things, but using different terminology. A debate I linked to recently on here was indicative of that, I think. The basic hitch was what was meant by “prophecy.” Depending upon how one defined it, they were either both continuationist or cessationist in their view.